The Best Garbage Disposal Repair in L.A. Most people don’t give their garbage disposal a second thought, at least not until it stops working properly and they realize that they’ll have to do something different with all the bits of food that get stuck to dirty dishes. The best thing you can do if you suddenly find yourself without a garbage disposal is to call us, L.A. Fixit, and question us about our repair services. We promise that you’ll be very happy with the answers you receive. The first step to dealing with a temperamental garbage disposal will be taking a quick peek under your sink and pressing the reset button. It’s surprising how many calls we take from people who think that they’re looking at a major repair process when simply pressing the reset restores the entire system. If pressing the reset button doesn’t cause your garbage disposal to start working, take a peek at your circuit breaker box and make sure you haven’t gotten a power surge which could have caused the breaker the garbage disposal is on to be tripped. If neither the reset button nor the circuit breakers seem to be the problem, you have two choices. You can either get out your do-it-yourself tool kit or handle the repairs on your own, or you can give L.A. Fixit a call and set up a garbage disposal repair appointment. A majority of our garbage disposal repair calls originate from Los Angeles residents who have encountered problems with their system. It doesn’t matter what time of the night or day you contact us, you can rest assured that you will be able to speak to a person who has a great deal of knowledge about garbage disposal repair. Our customer service rep will listen as you describe the problem you have encountered with the unit and, based on your description, offer troubleshooting suggestions. If the problem turns out to be something that can be handled with a little over the phone advice, they’ll make arrangements from one of our excellent L.A. Fixit repair techs to come to your home to analyze the situation and provide you with an accurate estimate. When you contact us about our garbage disposal repair services it will be nice if you have first taken a few moment to write down the make and model of your current unit. We have several expert repair technicians on staff and knowing the exact type of garbage disposal system you use make it possible for us to send the repair tech who has the most experience with that brand to your home. We support local businesses and want to make sure they run as smoothly as possible which is why we have put a great deal of effort into creating the best commercial garbage disposal repair services in Los Angeles county. No matter what brand of garbage disposal your business uses or how old the unit might be, we’ll be able to keep it running smoothly. In addition to repairing a damaged garbage disposal, we’re also willing to come in and handle regular maintenance work. 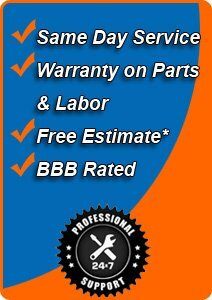 We offer same day, emergency garage disposal repair services to all Los Angles based businesses. It doesn’t matter if you’re trying to keep your home running smoothly, or your running a local business, money is tight right now. We understand that and don’t think that getting your garbage disposal repaired should be something that puts a strain on your budget. We’ve done everything we can think off to keep the cost of our repair services low without compromising the quality of our work. Before our L.A. Fixit repair techs start working on your garbage disposal, they will give you an estimate. This estimate will be honored. You’ll never find any hidden fees or additional charges on the final invoice. We encourage both our residential and commercial customers to shop around. If you find someone who offers a better rate, we will beat it! We have never understood why our competition thinks it’s okay to make someone take an entire day off of work and wait for someone to show up and repair their garbage disposal. We have strict policy to set repair appointments when it’s convenient for you. That’s right! When you decide to use our garbage repair services you won’t have to worry about taking time off work, canceling important appointments, or finding someone else to take your kids to their piano lessons. We work around you, not the other way around. Once an appointment has been booked, you can rest assured that our garbage disposal repair expert will show up on time. After they have provided you with an estimate, they will go right to work and have your unit up and running in no time at all. We take a great deal of pride in the fact that we’re able to guarantee any work that we do on your garbage disposal system. There are two reasons we can do this. First, we only hire the most experience, most educated appliance repair techs. Every single member of our repair team has been factory certified. They handle each call in a professional manner and make repair garbage disposal in an accurate and expedient manner. Having the best repair techs is just half of the equation. In order to provide top notch repairs, we have to use the best replacement parts. You’ll never find a generic replacement part in our service trucks. The parts we put into your garbage disposal will be specially designed for your brand of disposal and will work perfectly. You have our guarantee! Instead of learning to live without your garbage disposal, you should call us the minute you start to have problems with your system. You’ll be glad you did!